The Come Out and Play Jam was a one-day field game design jam put on by ESIDesign, the Come Out and Play Festival, Hive Learning Network and the YMCA. Kids between the ages of 14 and 18 showed up for the event. I created a Thimble page using the packet that was given to the kids for the event. The page has information about how to make a field game. Click the photo below to see it! This was the first event with Hive that I attended. I helped during the event, but I wasn't a part of the planning stages. During the event, I focused on documentation. I took a bunch of photos of the brainstorming and playtesting that the participants were doing, and took notes about the different games that were produced at the end. After the event, I put together multiple Thimble templates. One is the template above, which has the steps for creating your own field game. I also made a template for others to add their own information about the games that they make so that they can share their experiences! Click here to check that out. I think overall the event went pretty well. I wish that more of the kids who signed up had showed up, because we only had a group of about 11ish kids for the entire event. More kids would have resulted in more games and variations of games, but it was a really nice day and the event was inside. I think that the games that the groups came up with were really awesome! One group created a game called Knight Runners, where different teams had to steal their balls back from the other side, with different team members having different roles such as tapping the other kids with foam swords or touching someone with the magic purple ball. 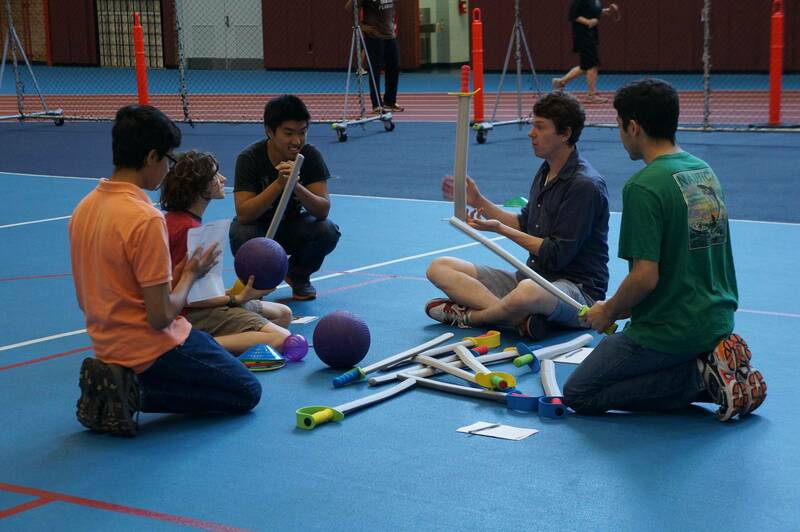 The other team came up with a game called Moving Targets, where everyone except one player started off paired up, holding a foam tube between them so that they looked like a goal. The one person not in a pairing had to throw a ball through a goal, and that would turn the two players into the ball throwers as well. The winners of the game were the last goal standing. It was great seeing the two final games and the progression of the games up to the last point. The different game versions were really cool and it was amazing seeing how they changed even in a half an hour period. I think that this event worked well for getting the kids thinking about creating analog games. I think I would keep this kind of event a little more playful. The kids were given a packet full of information, but I think it would have been neat to try to give them that information in a visual way instead of a packet of information. I also know that there weren't that many kids, but I think it would have been nice to see teams of solely kids. One of the teams had an adult on it, and I think that if it was all kids they would be able to work off of eachother better.